The herd of Pedigree Holsteins produce an average yield of 9,500 litres milking 210 cows, with butter fat at 4.35 and milk protein of 3.3 all on a calving index of 385days. The new unit with the existing one will give them a total of 315 cubicles. This covers dry cow and heifer accommodation. The new shed has been built with 8ft 6” bed lengths, wider passages and a generous allocation of feed space, in order to reduce lameness, bullying, improving dry matter intakes, resting times making for a healthier more profitable dairy herd. Neville visited farms where the C50 Post Mounted Cubicle had been installed for sometime and had proved not only to be a comfortable choice but robust and reliable with the ability to be height adjusted in order to perfectly position cows. These were the choice cubicle of 90% of the cherished Gold Cup winners in the UK. The primary objective was to have cows accessing cubicles easily, followed by quickly lying down. Not only would this contribute to increased yields & reduced lameness, but it left the passageways less congested & cow flow more natural. After the cow has taken her place in the cubicle, her positioning is then managed with proper neck bar, brisket, cubicle division & width location. These needs were assessed by Wilson Agri measuring the cows at the planning stage, and offering a tailor made solution that best fits the customers stock. The benefit was reduced labour, bedding usage and a more hygienic environment for the cow resulting in lower mastitis. Having had Pasture Mats on his farm for over 16 years with the original top cover still intact his choice of mattress was made easy as he had found it to be a reliable long lasting product which has served him well. The mattresses in the new shed are fitted with an additional soft foam layer which in many cases has led to an increase in production of, 2 litres per cow per day. This is shown by the independent study carried out by Grant in the US which shows 1.7kgs of extra milk for every extra hour of resting time. Giving a quick payback on the investment. This comes as a result proved through independent research at the University of Wisconsin that lame cows rest for 2hrs longer on this product the soft surface giving them the confidence to enter quickly and to get a better footing when getting down. The softness also means that when the whole body weight of the animal is spread across the mattress there are no point loads on the hocks so a significant reduction in hock damage occurs. This is something that Neville and Michael can add to their Pasture Mats in the old unit in time making them as good without the expense of replacing them completely. The new building is open on one side and is higher than the existing building on the other side allowing air to enter from both sides, essential for good ventilation having good natural light from the skylights. Artificial light is provided by High Pressure Sodium 250Watt lights providing an average lux level of 190lux which is key, to achieving an additional yield increase. 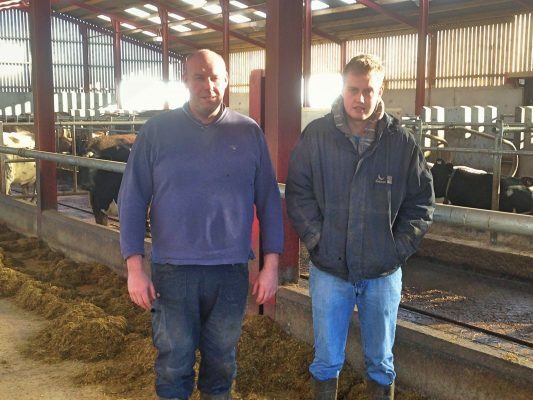 Neville and Michael intend to upgrade the milking parlour and the old unit, now that they can see the improvement which the new one brings. Their parlour is currently a 90 degree with meal feeding. The improvements in the new shed should ensure that cows enter the parlour with cleaner udders and less stressed given the long resting times achieved by their well thought out expansion, also it should ensure that not only do cows last longer on the farm gaining extra lactations but that higher yielders can be kept too. Doing the new shed first has been a wise move ensuring extra milk to help pay for the improvements to the parlour and the existing unit. The new shed has solid passages with a rope scraper system which Neville and Michael got worth the money, next to the feed passage they have fitted a 6ft width of Zig Zag rubber from Wilson Agri improving grip, reducing hoof wear as cows reverse out of the feed barrier and turn twisting their feet on the floor. It is known to encourage cows to spend longer at the feed barrier improving dry matter intakes and being reinforced with steel cable can endure the constant drag of a scraper blade moving every few hours over the top of it. Now with milk prices improving the benefits of all of this will be further compounded, and the Chambers father and son team well positioned to reap the benefit of better prices with the investment made during a difficult time in the industry.